As we come to the end of our first month online, I wanted to take the time to thank everyone for all of the incredible support! This month Ms. Celiac Says... has received approximately 300 first-time visitors, with over 100 that have returned back several times for more gluten free news! I am extremely grateful to have been featured on the Gluten Free Health website too! I am also proud to have opened Ms. Celiac's Shop where you can buy products to display your gluten-free pride in a fun, thought-provoking way! In the coming months, I have so many more restaurants and products that I cannot wait to tell you about and I have many new ideas for improving Ms. Celiac Says...to give you all the best gluten free experience possible. And thank you to all of the brands featured this month that have provided us living with Celiac Disease amazing gluten free food options! In case you haven't checked them out, please go to the following links (listed below) and explore some of the fantastic gluten free choices! 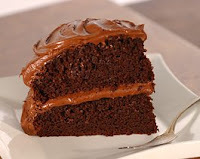 Today is January 27th and that means it is National Chocolate Cake Day! If you still haven't enjoyed this tasty treat today, then why not head to your local health food store and pick-up Pamela's Chocolate Cake Mix? Pamela's Products were established in 1988. All of their products are gluten free and contain absolutely no trans fats. They even make their products in a 100% dedicated gluten free facility. Many of their products are also dairy free, egg free, nut free, corn free, potato free, and soy free. And their products are certified kosher by the Orthodox Union. So, don't forget to get your chocolate cake and eat it too! 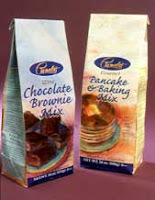 And for more information on Pamela's Products, check out the website at www.pamelasproducts.com. Do you miss the days of being able to go out to eat and ordering soup? The days when you didn't have to worry about the possibilities of hidden gluten lurking within your bowl? Well, if you are in the NYC area then you are in luck. Hale and Hearty Soups has an extensive gluten free menu. My two favorites are the 10 Vegetable and the Three Lentil Chili. Hale and Hearty was founded in the summer of 1995 and makes all of its soup from scratch using only the freshest and most high quality ingredients. The soups are available in 4 sizes: Small (8 oz. ), Medium (12 oz. ), Large (16 oz. ), and Quart (32 oz.). At the store you can also look for the symbols, V, L, and D that appear alongside some of the choices. They stand for the soups which are Vegetarian, Low Fat, and Dairy Free respectively. For a list of all the gluten free options and to order in their soup, visit the Hale and Hearty website at haleandhearty.com. As many of you living with Celiac Disease know by now, a lot of french fries (especially those that are frozen) contain gluten. However, if you still crave a delicious french fry and don't have the time to make them from scratch, you must try Alexia. Alexia products are all natural and contain no trans fats! A selection of their products are certified organic and are Kosher certified. All of their potato products are gluten free! I am a huge fan of Alexia potatoes as they provide so much flavor that is usually lacking from gluten free food. My favorite Alexia potato products include the Sweet Potato Julienne Fries, the Yukon Gold Julienne Fries with Sea Salt, and the Yukon Gold Mashed Potatoes & Sea Salt. You may order Alexia products online through Fresh Direct, Peapod, and the Wellness Grocer. Also, they are sold at many stores throughout the United States including Whole Foods, Costco Wholesale, Wild Oats, and Target. I have some exciting news to report! Uno Chicago Grill, a national chain, will now offer Gluten Free Pizza at all of their locations. For more information on this, read their press release. Also, Elisabeth Hasselbeck of the View will be releasing a survival guide to living gluten free in May 2009. For further details, visit Publishers Weekly. Today, I did some baking using a Gluten-Free Pantry Mix for Chocolate Chip cookies. I love the Gluten-Free Pantry mixes as the end results are always light and yummy. The Angel Food Cake Mix is one of my favorite gluten free cakes, but more on that at another time. I've provided a photograph of the Chocolate Chip cookies above. And in case you are new to the site and want to read my press release, you can check it out here. You may also download it at the link to the right. If you want to find out some books I recommend on Celiac Disease and a gluten-free diet, look for the Amazon ad on the bottom right of this page. And I have also included in the right-hand column a list of my favorite Gluten Free blogs. Don't forget to join my Facebook group too! If you are looking for a healthy, organic vegan restaurant that serves gluten free choices, then you should check out Angelica Kitchen. Angelica Kitchen is located in Manhattan's East Village on 12th street between 1st and 2nd Avenues. 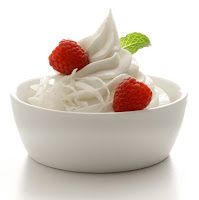 They use absolutely no refined sugars, no preservatives, no dairy, no eggs, and no animal products in their dishes. The extensive menu has many gluten free options, but make sure you ask for the gluten free menu which will show you which entrees are gluten free and which ones you may have to alter if you still want to eat. My favorite dish is the 3 Grain Mix that consists of quinoa, wild rice, and amaranth! Delicious and healthy! Ms. Celiac Says... is proud to open a merchandise store today. We are currently selling 10 different shirts and 1 tote bag with a variety of fun, clever, comical, and provocative slogans. Check them out at Ms. Celiac's Shop or at the link to the right! For those of you who have never experienced Italy on a gluten free diet, I recommend you get there as soon as possible! It will definitely be worth it! However, if that is not an option you can still enjoy one of Italy's best gluten free products right here at home. The company is called, Schar and was started way back in 1922 between Dr. Schar and an entrepreneur named Untertrifaller. It was in 1982 when they added a gluten free product line. This included breads, pastas, flours, snacks, biscuits, and sweets. The Schar Company is located in Burgstall / South Tyrol, Italy and is now Europe's #1 Gluten Free Brand. Up until 2007, Schar products were only available in Europe with a few select products being available to US customers through online retailers. However, in 2007 Schar started its North American line with 15 of its products. Last year, they added even more products to this line. And now they are considering opening a North American factory. While I was in Italy, I was introduced to some of their products. My favorites were the Cioccolini (biscuits with cocoa cream filling), Savoiardi (savoy biscuits), and Salti (salted crackers). Recently, I found Schar products in a NYC health food store called, The Health Nuts. I was able to purchase 2 delicious gluten free snacks - a Chocolate Hazelnut Bar and Table Crackers. If you've been craving a delicious gluten free macaroni and cheese dish that you don't have to prepare, why not visit S'Mac in the East Village? S'Mac (short for Sarita's Macaroni & Cheese) is a macaroni lovers paradise! It provides the most extensive variety of macaroni & cheese dishes that I've ever seen! You can choose from their menu or even create your own combination using a variety of different cheeses, meats, vegetables, and seasonings. And the best part is that every item on the menu can be made gluten free using breadcrumbs that are composed of corn and brown rice elbow pasta. They have worked with the Gluten Intolerance Group (GIG) to ensure that their dishes are safe for those on a gluten free diet. If you don't feel like dining at their location on 12th street between 1st and 2nd avenues then you also have the option of picking-up take-out or ordering delivery at their website, S'Mac. So, go get your S'Mac! Today is the inauguration of the 44th President of the United States of America. This is truly a groundbreaking moment for our country as the 1st African-American President will soon take office. It is a moment of inspiration and hope that positive change will come to our country. It is a time for us to focus on taking responsibility and accountability for our actions and our current life situations. In celebration of today's historic moment, Starbucks is serving FREE coffee to everyone. If you haven't already, head on over to the Starbuck's Blog, Ideas In Action, and answer a few simple questions about what gluten free products you would like to see at their stores. Also, I wanted to let everyone know that the Australian-based, Gluten Free Health website, has named my article on Starbucks, Save Me Starbucks!, as one of the Best Gluten Free Blog Posts of the Week. Thank You! And remember as Barack Obama said: "We are one people; we are one nation; and together, we will begin the next great chapter in the American Story with three words that will ring from coast to coast; from sea to shining sea - Yes. We. Can." Today I want to share with you one of my favorite gluten free products ever! It is the Still Riding Pizza Company pizza crust. The crust tastes so much like a real pizza crust that the first time I ate it I was continously checking to make sure it really was gluten free. 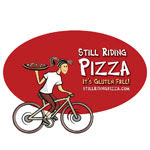 Another great thing about Still Riding Pizza is that it may even be available at your local pizza parlor! And you don't even have to worry about cross contamination as the Still Riding Pizza Company educates the restaurants they provide products to on how to safely prepare a gluten free pizza. And the Still Riding Pizza crusts are made in a 100% gluten free facility. If you live in Arizona, California, Connecticut, Florida, Georgia, Nevada, New Jersey, New York, Pennsylvania, Texas, or Washington, go to their website at www.stillridingpizza.com and find a location near you that serves this delicious pizza. If not, you can order a crust on their website and find out about how to get your local pizzeria to carry Still Riding Pizza crusts. In NYC: You can check these out at Bistango (415 Third Ave.) and at Pizza Bolla (102 N. End Ave.). I've enjoyed these tasty pizzas at both Plum Tomatoes Pizzeria in Mineola and at Villa Milano in Manhasset. The ingredients that compose this perfect pizza crust include: Bean Flour, Rice Flour, Tapioca Flour and Starch, Xanthan Gum, Salt, Yeast, Egg, Cider Vinegar, Sugar, Canola Oil, and Calcium Propionate. I hope you are all enjoying the weekend! I just wanted to take a minute to thank you and to let you know about a few things. First of all, Thank You, Thank You, Thank You! I am thrilled to announce that Ms. Celiac Says... has received over 100 unique visitors since it began only 2 weeks ago. I have already received so many positive responses to this site and words of encouragement, and I deeply appreciate all of your support! Secondly, If you are interested in advertising on this site please contact me at MsCeliacSays at Gmail.com for further information. I also was elated when I went to The Health Nuts for the first time! I had heard about this health food store with 3 locations in NYC before but I had never been to it. Well, I went there and completely went on a shopping spree buying so much gluten free goodness! They had a huge selection of gluten free products imported from Italy along with a wide variety of Joan's GF Great Bakes products. I definitely recommend you get there and check it out if you haven't been there before. It is a place that no Celiac should be unaware of. There are 3 locations in NYC - one on the Upper West Side on Broadway at 99th Street, another on the Upper East Side on Second Avenue btw. 63rd and 64th and another in Midtown East on Second Ave. at 45th Street. For those of you that live downtown, you may want to check out this small little health food store in the East Village called, The Open Pantry. It's on 2nd Avenue between 11th and 12th street -right around the corner from where I live and I've only just discovered it. But, it has a good, yet small selection of gluten free products. And I did some baking this weekend! I made the 365 Brand (Whole Foods Brand) Chocolate Chip cookies. I altered the directions a bit. I melted the butter instead of beating it until fluffy which therefore caused the chocolate chips to melt, creating a chocolate cookie as opposed to a chocolate chip cookie. I'll include a photograph at the end of this post so you can see how they turned out. They taste pretty good. Ok, well that is all for now! *Feel free to join my facebook group. The link is located on the right hand column of this page! I must admit that I have been a bit blog-crazy today but there are so many things that have been going on in our Celiac World. I just got back from dinner with a group of friends at Mario Batali's Otto Enoteca. Anyway, this post is to let you know that I've updated the 2nd posting - "Mario Batali Is A Gluten Free God" with a photograph of the Pasta alla Norma. Another great thing about Otto Enoteca that I neglected to mention in the original posting is that in addition to their selection of gluten free pasta dishes, the gelati is gluten free too! And they have an assortment ranging from olive oil to hazelnut. I enjoyed the dark chocolate and coconut gelati tonight and it was delicious! On a side note, they also have the most amazing bellinis! And in this economy it is great because they serve good food at a reasonable price - always a nice combination! I was thrilled when I found out that my favorite NYC restaurant accommodates those on a gluten free diet! When dining there, make sure to notify the waiter that you are on a gluten free diet and they will bring over San-J's Wheat Free Tamari soy sauce. They also do not use malt vinegar to prepare their sushi rolls, so those are gluten free, as well. And if you're not into raw fish, they have plenty of other delicious Japanese dishes that can be made gluten free. Also, make sure to leave room for dessert. The Bento Box Chocolate Cake is gluten free! Nobu 57 is in New York City on West 57th street between 5th and 6th Ave. There is another NYC location in Tribeca and many others throughout the world. So, I had planned to discuss one of my favorite restaurants today but after dining last night at Balthazar Restaurant in NYC's SoHo neighborhood, I knew I had to write about my experience. Now, I've been to this restaurant several times before and they have always been very accommodating to my diet but last night I was even more impressed than usual. Normally, after I notify the server of my restricted diet, I have the option of choosing from a selection of fish or meats. It is a very large selection so I can get some variety, but last night I felt like something different. I didn't really feel like a protein based dish. I wanted some carbs! To my surprise, the Shrimp Risotto with celery root and rosemary is gluten free! It is available to order in an appetizer portion and a regular-sized portion. I had the appetizer size and it was definitely enough - very filling. It was one of the best risotto dishes I have had! So, if you're in the area you might want to check out Balthazar Restaurant, a traditional french bistro. Just a quick update to let you all know about a new feature coming to this blog. If you look on the right sidebar you will see a link that leads to a merchandise store. 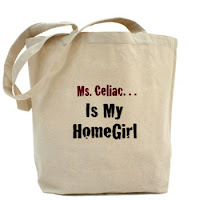 Ms. Celiac's Shop will be opening within the next few weeks and will sell creative, funny, and inspirational products for you to display your gluten free pride. Ms. Celiac's Shop - Coming Soon! For a taste of authentic Venezuelan cuisine, check out Tisserie Bakery. They just recently introduced arepas onto their menu. This delicious gluten free sandwich is made of corn meal, salt, water, and oil. Tisserie offers a variety of fillings for their arepas from eggs to meats to cheeses to jams, however, make sure to check with them on which ones are gluten free. 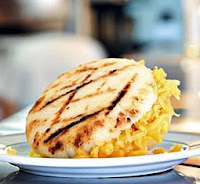 For more information on the arepa, click here! Missing some of your favorite childhood snacks? Thinking that you will never be able to enjoy them again? Well, now you can with products from Shabtai Gourmet! Shabtai Gourmet is a DEDICATED gluten free bakery with products that are also casein free, corn free, dairy free, lactose free, and soy free! Even better, they are also certified KOSHER for Passover and Kosher Parve and are "dairy free by the OK Kosher Supervision." 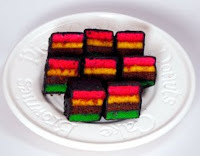 Some of their famous products include Ring Ting Cupcakes, Devils Food 7 Layer Cake, Lady Fingers, Marble Loaf Cake, and my personal favorite, Rainbow Cookie Squares! And at an Italian restaurant, Sambuca, located on the upper west side at 20 West 72nd street btw. Central Park West and Columbus Ave. This restaurant also features a gluten free menu. If you don't live in the area, Shabtai Gourmet offers FREE SHIPPING on ALL orders placed within the continental United States! As I was walking around the neighborhood, I noticed a sidewalk sign that read, "Gluten Free Cupcakes." My eyes were immediately drawn to it and I soon found myself entering Pinisi bakery. Their gluten free offerings consist of brownies and cupcakes. The cupcakes are not always available so I would recommend calling before stopping by (212-614-9079), however, they are sure worth the wait. I've had many gluten free cupcakes and these are truly the best I've ever had! One of my favorites of their cupcake variety has a moist chocolate cake with the most delicious icing cream ever that seems to have a hint of marshmallow in it. The brownies are also unlike any other gluten free brownie out there. Sure, there are many gluten free brownies already on the market that taste like the real thing but these are more like chocolate-y fudge! 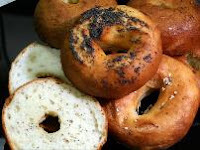 Be sure to stop by Pinisi, a gluten free jewel located in the heart of the East Village. Here is an extremely easy recipe for making gluten free / dairy free / egg free icing cookies! It's also very fun to make. So, follow the instructions on the Sugar Cookie Mix Box - essentially mixing all of the ingredients together. Next spread out the dough and cut into shapes. GOOD NEWS - Since there is no egg, it's alright to eat the raw dough! Put shapes on cookie tray and bake in oven. Once the cookies are cool, decorate with icing. Let sit until icing hardens and then put cookies in containers and place in freezer. Eat frozen or defrost and serve at room temperature.